Babies born by Caesarean are nearly three times more likely to die in the first month than those born naturally, US research shows. The findings, based on over 5.7 million births, are particularly important given the growing trend of women opting for Caesareans, say the authors. More than one in five of all British babies are now born by Caesarean. The Birth journal study included women with no obvious medical risks who had elected to have a Caesarean. 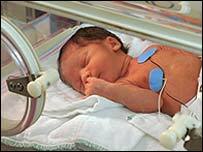 Even after adjusting the results for social and medical differences among the women, babies born by caesarean were still at more than twice the risk of dying in the first month of life. From 1998 to 2001, the death rate among those delivered by Caesarean was 1.77 per 1,000 live births compared to 0.62 for vaginal deliveries. Generally, neonatal deaths are rare for low-risk women, in the order of one death per 1,000 live births, according to the lead researcher Dr Marian MacDorman of the Centers for Disease Control and Prevention. However, the study only include babies that were born alive, which the researchers said would change the results. Had stillbirths been included, the risk of vaginal deliveries would have been closer to that of Caesarean deliveries. Also, the deliveries in the study ranged from 37 weeks' gestation to full-term or 41 weeks. In the UK, planned Caesarean sections are performed after 39 weeks' gestation because it is known that deliveries earlier than this carry a higher risk to the baby. And the risks of both types of delivery are still extremely small. The researchers suggest that the process of labour helps prepare the baby for life outside of the womb. As well as squeezing fluid out of the lungs, it may promote the release of hormones that encourage healthy lung function. Dr MacDormac said: "Labour is an important part of the birthing process because it gets infants ready to breathe air and function outside the womb." Professor James Walker, consultant obstetrician at St James's University Hospital in Leeds and spokesman for the Royal College of Obstetricians and Gynaecologists, said women should not be alarmed by the findings but should be informed. "The absolute risk is still very small. "But it should open people up to the fact that there are risks and benefits of everything. This is a relatively small risk but it is there and people need to know that." Belinda Phipps of the National Childbirth Trust said: "I think that the study does need to be taken pretty seriously." She said that earlier studies had already hinted that babies born by Caesarean are more likely to experience breathing problems.